Original art from First Kiss #21, 1961. MAN: most women think I’m a whiny loser! But…you’re different, right? Art from “Change of Heart” in First Kiss #37, 1964. Click image to enlarge. SCENE: Man and woman are dancing. WOMAN: I haven’t slept with all your friends---just the cute ones! Lust? Not This Time, Buster! 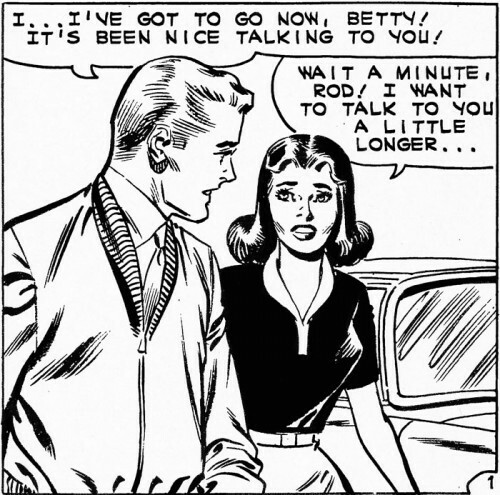 Art from First Kiss #32, 1963. Click art to enlarge. SCENE: On a penthouse rooftop, a woman in a cocktail dress recoils as an older man reaches out to her. WOMAN: Sure, I’ve dated men older than you! But that was different! I liked them! Original art from Just Married #10, 1959. I could be wrong, but it seems like women in popular entertainment are more likely to be portrayed as strong, heroic action-oriented characters if the stories are science fiction or fantasy-based. Buffy, Xena, Wonder Woman, Emma Peal, Ellen Ripley, Sarah Connor, Lara Croft, etc. Why? Is it safer if it’s a fantasy? SCENE: Woman sitting at desk with a pen in her hand. 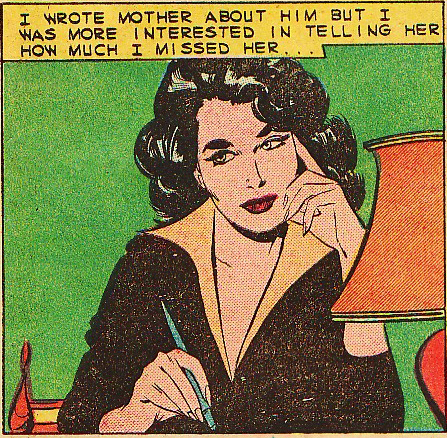 WOMAN: I’m writing science fiction, so…gosh! 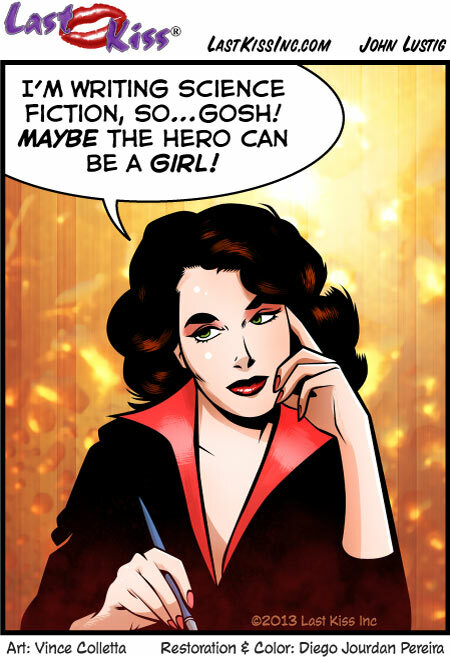 Maybe the hero can be a girl!